Clay Hall, with the grand prize bracelet. This holiday season will shine particularly bright for Umpqua Bank’s Clay Hall. 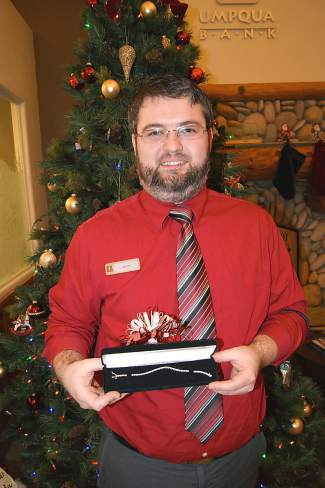 In the final prize drawing from Tahoe Family Solutions Bowl for Families event on Nov. 7, Clay was randomly chosen as the grand prize winner of a 3-carat diamond tennis bracelet from Diamonds By Shai. This year, Bowl for Families raised more than $25,000 to support TFS programs in counseling, camping, and education. TFS thanks all the bowlers, local businesses, and supporters that helped make the day fun for attendees and impactful for local families who are most in need. Some additional prize winners from the day include the highest team score by IVGID, highest game by Richard Williams, and most money raised by John Isaacson, among others. TFS deeply appreciates and acknowledges Bowl for Families’ presenting sponsors: Diamonds By Shai, Bowl Incline and North Lake Tahoe Bonanza. Additionally, TFS thanks all of the participating Bowl For Families lane sponsors: Incline Spirits and Cigars, Austin’s, Postal Express, Kissino Pasta Sauce, The Potlatch, Susan and Mark Herron, Gary and Perri Finch, Azarra’s, T’s Mesquite Rotisserie, Village Market, Big Water Grille, Sierra Verde and Rookies. This article was submitted by Tahoe Family Solutions. Visit tahoefamily.org to learn more.